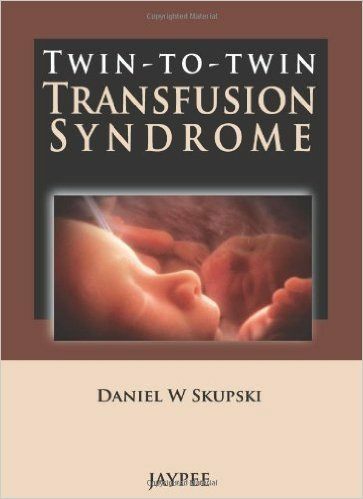 » What is TTTS – Twin to Twin Transfusion Syndrome? What is TTTS – Twin to Twin Transfusion Syndrome? 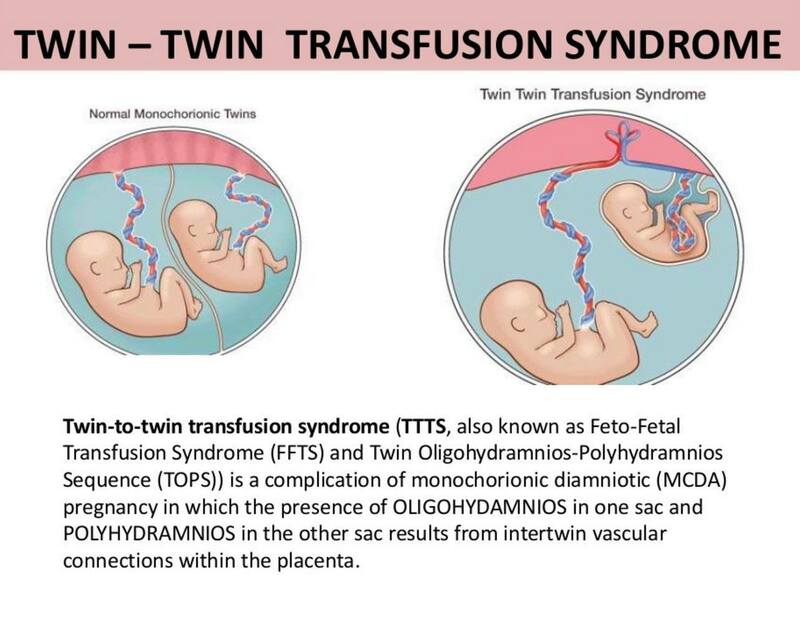 Twin to twin transfusion syndrome (TTTS), also known as Feto-Fetal Transfusion Syndrome (FFTS) and Twin Oligohydramnios-Polyhydramnios Sequence (TOPS)) is a complication of disproportionate blood supply, resulting in high morbidity and mortality. It can affect monochorionic multiples (mono mono and mono di), that is, multiple pregnancies where two or more fetuses share a chorion and hence a single placenta. TTTS is a very serious complication affecting approximately 15% of identical twin pregnancies. TTTS is a disease of the placenta. It affects only monozygotic (“identical”) twins sharing a single placenta. As the placenta develops, the blood vessels form in such a way that vessels from one umbilical cord connect up with vessels from the other. This causes a sort of “short circuit” between the babies. It can create a transfusion situation where one baby does not have an opportunity to process fluid coming to it because the fluid immediately gets sent over to the second baby. Samantha and Alexis were monitored for signs of TTTS. Stuck Twin: The donor twin will appear stuck to the wall of the chorionic sac on an U/S. This is because there is little or no amniotic fluid inside the baby’s amniotic sac and the dividing membrane has shrink wrapped to the wall. The membrane separating the twins can be difficult or impossible to find when the donor baby is completely stuck to the wall of the sac. Septostomy: The intentional rupturing of the dividing membrane between the babies; this creates a Monoamniotic pregnancy (see Monoamniotic below). Fused Placenta: When the placentas of fraternal twins form close together in the womb, it is possible for them to grow into each other. On an ultrasound, they are almost indistinguishable from a single placenta. Even post-birth biopsy can not always enable doctors to distinguish a single placenta from a fused placenta. Monoamniotic (MoMo): Some identical twins share both the chorionic sac and the amniotic sac. This is an uncommon configuration for identical twins and has many risks associated with it. TTTS patients are sometimes misdiagnosed as Monoamniotic since in both cases there is no visible dividing membrane (see Stuck Twin above). Stage II TTTS: Same as Stage I without any visible bladder in the donor baby. Stage III TTTS: Same as Stage I (atypical) or Stage II (classic) with critically abnormal Doppler readings. Often, the first sign of TTTS is a “stuck” twin. This is caused by one baby not receiving enough placental blood to make much, if any, amniotic fluid. The membrane separating the babies will shrink wrap the baby to the side of the amniotic sac. Doppler ultrasound can also detect uneven or unbalanced flow within the two cords. Other signs are a weight and/or size differential of 10%-20% between the twins. Often, the mother’s belly can grow so quickly that it could measure 24 weeks one day and 40 weeks 4 days later. 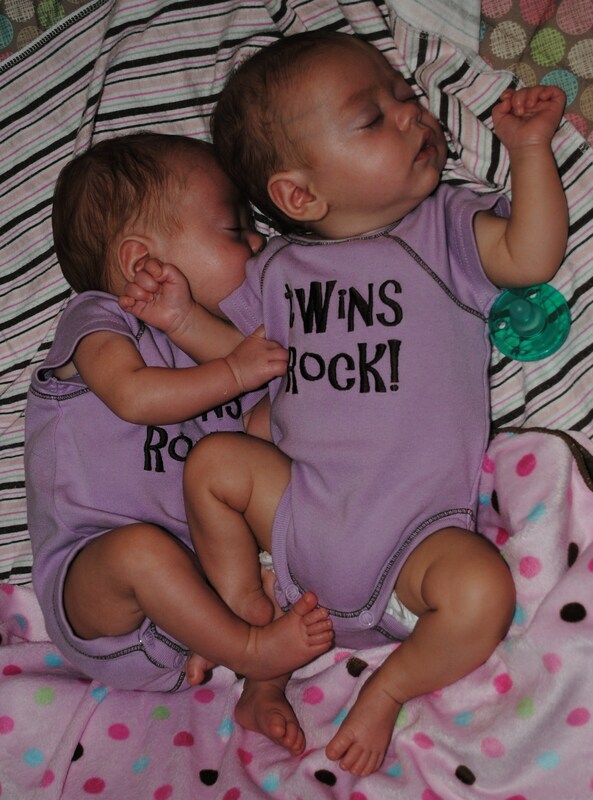 When Does Twin-to-Twin Syndrome Happen? TTTS can strike at any time during the pregnancy. Usually, a first trimester occurrence of chronic TTTS is fatal and there is nothing mother or medicine can do about it. 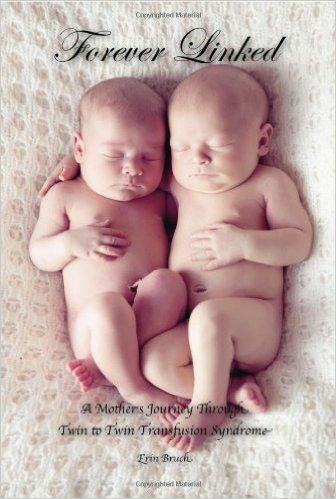 No one has proven it yet, but it is suggested and stands to reason that there are probably lots of parents who never know that there were twins growing in there before the babies pass on and begin to be absorbed back into the womb. Second trimester chronic TTTS is very problematic because any invasion of the womb could trigger pre-term labor, which would be fatal at this point. The babies are too small to deliver and too big for re-absorption. Current procedures give these twins a fighting chance where, even just a few years ago, little chance existed. Third trimester chronic TTTS is perhaps the easiest to deal with. In this case, the babies are viable outside the womb, so, if things get too bad, the option to deliver is real. In this Video Dr. Ahmet Baschat, Director of the Johns Hopkins center for Fetal Therapy answers the most common questions about Twin to Twin Syndrome. When is a mother typically diagnosed with TTTS? How is twin to twin transfusion syndrome typically treated? What can a patient expect after this procedure? Is there any special follow up required after the birth of the twins? A diagnosis of TTTS is a shock to parents who have been joyfully expecting an uneventful pregnancy. Like many medical mysteries, the cause and development of TTTS is not yet fully understood by even the leading doctors in the field of TTTS research, but more and more is being learned every day. Huge advances in the ability to analyze and diagnose TTTS have been made over the past couple of years. New laser techniques pioneered by Dr. Quintero (Tampa) and Dr. De Lia (Milwaukee) are showing amazing success when compared to more traditional methods of combating the disease and there are several programs around North America and Europe that are currently working hard to understand the syndrome better so that a better treatment plan can be.prescribed. Unfortunately, most doctors practicing today were trained before these advances were known, and the currently available statistics on TTTS do not reflect the most recent successes, either. As a result, few doctors are actually current on the newest techniques for diagnosing and treating the disorder, and this results in some less than accurate assessments of the babies’ chances of survival. Until the general medical community is familiar with the advances in the field, and the literature reflects the newer, more positive statistics, patients may need to, advocate for themselves and their babies and look a little harder to find the right course of action for them. There are new procedures and protocols available today to improve your babies chances of surviving TTTS. First of all, I want to stress that because of different combinations of cross-connecting and different sizes of those vessels that do cross-connect, this disease can show up in a very wide number of ways. As there is little that can be done in the early stages of the pregnancy, I will try to focus more on second and third trimester cases. It is not uncommon for a TTTS pregnancy to be mistaken for Monoamniotic (MoMo) early on, if the donor baby is not receiving excess blood right from the beginning. The diagnostic clue is that the donor baby will be “stuck” to the wall of the womb and will move its limbs little, if at all, during the ultrasound reading. It may also be difficult to detect the donor baby’s bladder through ultrasound, if TTTS has progressed far enough. Each ultrasound visit should include a Doppler reading of the blood flow in the cords and other places. In the cords, differences in flow should be measured and noted and, if possible, the number of vessels that are functioning in each cord should be determined. This can give you an idea about placenta share and it can be a supporting clue in a TTTS diagnosis. If TTTS is allowed to progress without intervention, the recipient baby may begin to experience a hardening of the heart. This is caused by 2 factors: 1) the amount of blood being processed (since this baby is getting its own supply plus some of its sibling’s) and 2) the thickness of the blood. This hardening of the heart can progress to a point where heart failure occurs. Should heart failure begin, water drops, called hydrops, will form in the recipient’s body tissue. This will usually precede the demise of the baby by only a couple of days, if that many. However, should TTTS be corrected by any method, (such as amniotic fluid reductions, surgery or birth) before it has advanced to far into this stage, the heart will usually correct itself as it grows. Anemia is the biggest problem for the donor. If left untreated, TTTS-driven anemia will be terminal for the donor baby. Again, if intervention corrects the transfusion syndrome, then the anemia will correct itself. What is the gestational age of the babies? What is the size difference between the babies? What is the fluid level around each baby? The second thing you should do is schedule a second opinion. This is no reflection on your doctor’s abilities. Twins occur about once in every sixty pregnancies. Monozygotic twins account for about one third of these twin pregnancies, and TTTS occurs in an unknown fraction of the monozygotic twin pregnancies. Some OBs can go their whole careers without diagnosing a single TTTS case. Most see only a handful throughout their careers. There have been a lot of advances in diagnosis and treatment over the past 5-8 years, but not every OB will be familiar with the syndrome or the advances in treatment. Since doctors do not see it often, they may not feel compelled to spend much time keeping up to date with it. It is always my recommendation to get a second opinion from one of the leading experts in the TTTS field. One good thing about the second opinion here is that it does not require a second trip to the doctor. Doctors can review the U/S results remotely. You need only get in touch with the two doctors’ offices and they will transfer the information. In many cases, contacting one or the other is enough, as long as you supply all of the necessary contact information. TTTS progresses rapidly once it begins showing its ugly head. Often, the prognosis is grim. Due to the low occurrence of TTTS in the population, and the newness of some of the treatment plans, it could be a number of years before the statistics available to most doctors accurately reflect the growing success rate of the new medical procedures. Most doctors currently believe that, when left untreated, chronic TTTS diagnosed before week 25 is so close to 100% fatal that survival odds are almost negligible. You may be told that you have, at best, a 5-10% chance of taking even one baby home some day. Most parents are devastated. When parents finds out that a child is on the way, they begin preparing emotionally and logistically. When they find out there are 2 babies on the way, they often go into overdrive and double their commitment to the pregnancy. It is difficult enough to come to terms with the fact that it is twins; to deal with the prospect of the imminent loss of both can be devastating. The third thing you should do is find hope. Seek out ﻿﻿someone who has traveled the road of TTTS. I cannot encourage you strongly enough to get in touch with someone who has walked this road ahead of you.. Thanks to the various new techniques, TTTS patients enjoy a tremendous and rising success rate, and talking about this with someone who has experienced it, and hearing their success story, can be tremendously reassuring and empowering. Today, with proper treatment, there is a lot of reason for hope. In this book Erin Bruch shares the powerful and heart wrenching story of how her most blessed event became her greatest trial when her unborn twins were diagnosed with TTTS. She shares her personal reflections, the nature of this disease, current treatments, and the practical and emotional advice for families facing the diagnosis. The only non profit organization in the USA dedicated solely to TTTS. Provides support by e-mail and phone. Provides a comprehensive book on TTTS to newly diagnosed TTTS patients via the mail. Provides other support on a case by case basis. Some information regarding TTTS. A 501(c)(3) non-profit charity that provides factual medical information on fetal syndromes, provides unconditional support to families dealing with these syndromes, provides advocacy and awareness around fetal syndromes and provides research grants funding new treatments and technologies. If you have anything to share about twin to twin transfusion syndrome, please leave a comment below.